A fun wedding catering option is to hire a food truck. This catering style is a wonderful choice for couples on tight budgets and planning an informal nuptial venue. 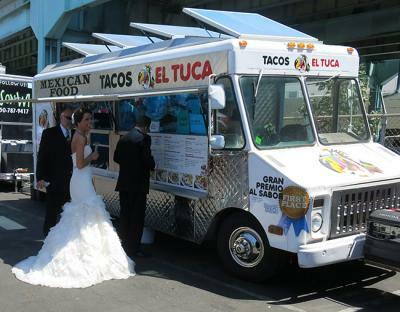 Since food trucks are a newer option for serving food at your wedding, you first have to work out the logistics. In addition to being mobile on wheels, many food trucks have a website so you can contact them and see a listing of their schedule of locations and events. At a food truck meetup event, several food trucks will pull up to a specific location on a set date and time. Whether it is one of your date nights or an event you run by after work, look out for food truck events as you're driving around town. Keep your eyes open for food truck meetup events in your local newspaper, event calendars and advertisements around town; you can also find them through websites like Eventbrite and Meetup. Food trucks carry their own permits for running the business and for parking on city streets, so you don't have to worry about that aspect of hiring a food truck. What can be tricky is the parking availability for your venue. If you are hosting your wedding in a big city that has zero parking, it can make it difficult for the food truck to pull up and park. Check with your venue to see if you can reserve spaces on the city block or if there is a location the food truck can park that is convenient to the venue. 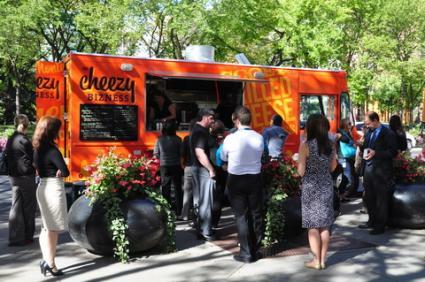 Some cities, such as Chicago, have ordinances for food trucks. For example, Windy City requirements include stipulations that food trucks park at least 200 feet away from a restaurant venue entrance and cannot serve food for longer than two hours, in addition to following the Chicago Zoning Ordinance. You will also need written permission from your venue to have the truck park on private property. Check with the city where your wedding is to find out the parking, ordinance and zoning rules for hosting food trucks at your event. The best time of year for weddings to use food trucks is spring. Generally, spring is not too hot or too cold for guests to mingle outside while enjoying the latest food fusion concoctions. That being said, however, if you've set the date for another season, food trucks are still an option. Consider hiring a truck that serves specialty hot chocolate for a winter wedding and gourmet ice cream sandwiches for summer festivities. In the case of inclement weather, such as rain, it's important to have a backup plan, as is the case with any outside wedding. Plan to put up a tent to cover tables, chairs and guests while they eat. Many food trucks have an awning over their order window to shield guests placing their order from the elements. Set up a basket full of umbrellas guests can use to shuttle back and forth with so they don't get wet and neither does their food. One food truck can safely serve about 75, maybe 100, people without creating long lines or a long wait for food service. If you have more than 100 guests, then you should consider hiring more than one food truck. You can also hire the number of trucks it takes to serve the types of foods you want to offer. For example, if your favorite food truck serves gourmet burgers, but no sides, then consider hiring the best French fries and milk shake trucks available to complement the main food. Arrange for tables, chairs, and linens with your venue. If the venue doesn't offer these services then you can rent them from a local party rental business. If your wedding reception is at a local park, the park might have enough benches, picnic tables and tables with benches, so work with what you have or rent what you need. For a less formal affair, you can even rent high-boys, which are tables that don't require chairs, so guests can stand, eat and socialize, but have a place to set down their food and drinks. You don't have to make your guests wait in line to place their order. Instead, opt to hire servers. Servers can run the food from the trucks to the tables where the guests are seated. You can also choose to go buffet style. Set up a buffet table full of the food from the food truck or trucks and allow guests to serve themselves. Food truck service can benefit your wedding event and your guests in numerous ways. According to The Daily Meal, food truck catering costs significantly less than traditional catering. The average cost for food truck catering is around $10 per person. Other sites, like Thumbtack, estimate costs closer to $25 or so per person, but still below the average for a sit-down meal. Typically, this is because food trucks have lower overhead costs than traditional catering options. Costs vary depending on your location and your menu. However, food trucks aren't always cheaper; as is the case with any wedding vendor, shop and compare the costs for the food and any items you have to rent to pull the event together. Food trucks tend to specialize in one particular food or one particular type of food (organic foods, vegetarian foods, or Slavic food, for example). Hiring one truck or more trucks can bring new foods to your guests' palettes. 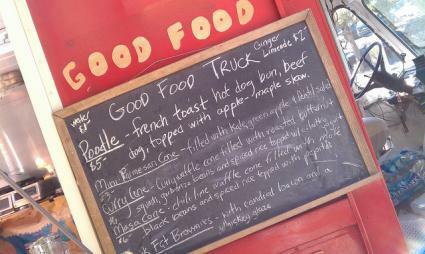 A food truck, somewhere in the country, exists for almost any food you can think of serving. The catch is finding out if there is a truck that serves what you seek in your area. Food trucks tend to serve mind-blowing food when it comes to taste. This is why you can often find a long line strung outside of the food truck. Because the focus of the truck is one food or one type of food, the chefs tend to put their own twist on common foods, fuse together combinations of foods most wouldn't think of doing, and focus on making the best of the best. Cleanup is a breeze. Food trucks serve items on disposal and throwaway plates and trays and in food cones. If you want to get fancier, you can buy bamboo disposable plates and utensils, for example, but this will add to your overall wedding costs. When guests are done eating all they have to do is throw their items in the trash. There is no need for the wait staff or caterer to clean off tables and wash dishes. Along with the good comes the not so appealing side to having food trucks cater your wedding. In addition to potential weather problems and dealing with city ordinances, you also may find issues with informality and availability. Having guests stand in line or mingle outside of a city street in their "Sunday best" can be a bit on the informal side. Guests can be less than thrilled about making the line and ordering their own food as if they are at a fast-food joint. Minds may or may not be swayed once they sink their teeth into the first bite of the delicious menu you've arranged. Food trucks you want to hire simply might not be available close to your venue. You can try surrounding towns and cities to see if the truck is willing to make the trek. Bigger cities tend to have food trucks available for events with a variety of menu options. Smaller towns and cities might not offer the same availability or variety of choice to take advantage of the food truck craze. You have a couple of different options when it comes to setting the wedding menu. Choose a set menu with the food truck or trucks you choose rather than having them make their entire menu available, assuming they serve more than one item. This can also help to keep costs down because the truck doesn't have to stock and prepare multiple foods for order. You can infuse food trucks into your wedding without having your main meal come from a truck. Instead, opt for a specialty truck to pull during your cocktail hour and/or at the end of the event. Fill guests up on those mini Korean-Mexican fusion tacos during the cocktail and top off their night with a gourmet donut or cupcake truck to send them and their sweet tooth home full. Bring a variety of foods to your guests by trucking it in to your wedding. 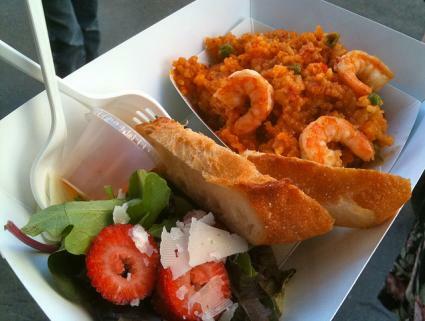 Food truck catering can save you time and money and send your guests home full and happy.